The large numbers of refugees crossing from Libya into Tunisia or Egypt has been prominently featured in international news media. Over at BAG News photographer Alan Chin has a couple of photoessays from the border-region up (1, 2), the below evocative picture being located at the second post. A very high proportion of these refugees aren't Libyan citizens, but rather, immigrants of greater or lesser permanency, illustrating the extent to which Libya's oil-driven economy made it a society of mass immigration. The refugee agency says some 55,000 people have arrived in Egypt in the last 10 days, one-third of them Asian workers. Fifty thousand others, including 2,000 Chinese, have entered Tunisia. And it said a group of people from Bangladesh, Thailand and Pakistan were marooned without papers in a no-man’s land between Libya and Egypt. Meanwhile, UN humanitarian chief Valerie Amos said those who remain in the Libyan capital Tripoli may not get badly needed aid because it’s too dangerous there. Aid groups fear that food stocks will run out as the violence continues between President Moammar Gadhafi and rebels who are fighting to oust him. Migrants from countries like Bangladesh and the Philippines, he added, were usually registered and came with documents and contracts. But now they, too, are scrambling for the borders and begging for help to get back home. Those who have fallen through the cracks the most, Chauzy said, are West and Sub-Saharan Africans lured by Libya’s relative prosperity. The millennia-old migrants' routes connected the west African interior with the Libyan coast were supercharged via Gadaffi's pan-Africanist flirtations, as described in a 2004 Washington Post article. During the 1990s, in the name of African unity, Gaddafi opened the borders to tens of thousands of sub-Saharan Africans to live and work in Libya. For the past four years, resentment over the policy has led to occasional riots and frequent bitter confrontations between the immigrants and Libyans. In effect, the problems mark the end of an officially ordained dream. Last month participants at an African Union meeting in Libya's coastal city of Sirte, Gaddafi's home town, rejected his proposal for a continent-wide army. A few days later, the General People's Congress, a consultative assembly that meets annually, ratified laws to restrict immigration and to expatriate Africans and other immigrants who live in Libya but have no steady jobs. "You have work, you stay. You don't, you go home," said Giuma Abulkher, a government spokesman. "There will be strict controls." The closed door is part of a shift in Libyan priorities. After decades of presenting himself first as a leader of the Arab world and then the African continent, Gaddafi has turned to the West. He is giving up chemical and nuclear weapons programs and declared that Libya would no longer support rebel movements across the globe. The United States is moving to restore diplomatic and trade relations cut off during decades of hostilities. Libya plans to privatize its state-dominated economy. Shutting out other Africans will probably prove popular. In a closed, politically fearful society, opposition to Gaddafi's immigration policy is one of the few outward signs of discontent with his government. While Libyans are usually reluctant to openly discuss such issues as democracy, succession and economic policy, the immigration question provides a vent for complaints that quickly spill over into expressions of general unhappiness. "It's about time. How can we have all these poor people here when we are poor ourselves?" said Osama Tayeb, a tout at a chaotic taxi stand in the old city. "First we help revolutionaries everywhere, then we give Libya to the Africans. Enough of this. Libya for the Libyans." Mohammed Mabrouk, a waiter, blamed immigrants for a wide variety of societal problems -- crime, prostitution, dirty streets. "Look, they get away with everything. We could not touch our African brothers. They bring drugs, they smuggle people. We don't need this," he said. About 600,000 sub-Saharan Africans are estimated to live among Libya's population of 5.5 million. They were lured by a relatively stable currency and jobs that many Libyans, in their highly socialist economy, decline to do. They sweep streets, work in restaurants and peddle a dizzying collection of merchandise -- cosmetics, pirated recorded music, clothes and secondhand auto parts. Raggedy men selling single articles of clothing and knit caps stand in line inside an arched stone gateway to the old city. Their headdresses and wool or cotton robes indicate origins across a wide swath of Africa: Nigeria, Ghana, Chad, Mali, Somalia, Sudan and Congo. Some of the migrants come to make the perilous journey to Europe across the Mediterranean Sea. Last summer, 200 Africans traveling to Italy by fishing boat drowned when their rickety craft capsized. During peak summer season last year, as many as 2,600 Africans arrived each month by boat on the Italian island of Lampedusa, an isolated stop between Libya and Sicily. Later on, as part of his turn to3wards the West Gadaffi later signed accords with Italy which triggered the regime's very harsh controls over illegal migrants. The marginalization faced by this community was dramatically worsened when Gadaffi, not trusting his regular army, instead recruited thousands of sub-Saharan Africans as mercenaries to use against his subjects. These seem to have been pawns. "A man at the bus station in Sabha offered me a job and said I would get a free flight to Tripoli," said Mohammed, a boy of about 16 who said he had arrived looking for work in the southern Libyan town only two weeks ago from Chad, where he had earned a living as a shepherd. In halting Arabic, Mohammed, the young Chadian, tried to explain how he had ended up on the wrong side in somebody else's revolution. Mohammed drifted into Libya looking for casual work, like many sub-Saharan Africans, perhaps with the hope of eventually finding people smugglers who would take him across the Mediterranean to Europe. "I wanted a better life, not war and destruction," he said. He insisted that he had been treated well since his surrender, with regular meals, and said he hoped he would be allowed to return home soon. "I didn't really know what was going on. They told me to do these things and I was really scared when the shooting started." Al Jazeera and All Africa both carry reports of sub-Saharan African immigrants, whether legal or otherwise, being subject to attack by angry Libyans. The Egyptians seem less vulnerable, likely becaquse of their perceived similarities to the Libyans, their lack of involvement in the revolution, and perhaps because of the concentration of this Egyptian migration beginning in the 1960s professional categories of employment. These Egyptians are still returning to their homes, however, hitting the economy of their homeland further. "Losing these remittances will of course make the situation worse here," Rashad Abdu, a professor at the University of Cairo, said. "Libya is an important and close destination for hundreds of thousands of Egyptian workers who could not find jobs in their country." About 1.5 million Egyptians work and live in Libya, and send an estimated 1.5 billion Egyptian pounds (US$254 million) in remittances back home every year, according to the Egyptian labour ministry. Many sought work in Libya because the local economy could not absorb them. "The sorry thing is that it will take most of these people a long time to find jobs in their home country," said Saleh Naser, chairman of the Labour Section at the independent Egyptian Chamber of Commerce. The chamber is composed of company owners and businessmen who try to coordinate the government and the business community. "The only way out now is for the government to try to open new markets in the Gulf for these people," he said. According to the Chamber of Commerce, an estimated 10 percent of Egypt's 26 million working population are unemployed. Egyptians working abroad remit about US$12 billion annually to their country. The state-run National Planning Institute, however, expects a decrease during the third quarter of the current financial year because of political turbulence in the Middle East. Protests against the Hosni Mubarak regime in Egypt forced the Central Bank to shut banks for more than three weeks; they only resumed normal operations on 20 February. "Egypt has a budget deficit and a government debt load that are teetering on the edge of sustainability," says think-tank Stratfor and the fall-off in remittances will only make matters worse. Some of those who have returned are the family's sole breadwinner. According to 59-year-old Youssef Fawzi, his son Marwan, used to work in Libya, and household would now struggle without that financial support. The Egyptians working in the east of Libya, adjoining their homeland, seem to have been able to escape. The Egyptians working in the west, along with other migrants, seem less fortunate. More than 100,000 people have fled Libya in the past seven days. As the final battle for Libya looms, the crowds of escapees become bigger and more desperate. Almost half of them have come through this narrow stretch of road leading across the northern Sahara into Tunisia. There are teams of Chinese oil workers in identical uniforms, large packs of Bangladeshis, scatterings of Japanese, and mostly thousands and thousands of Egyptians, who have provided the bulk of Libya’s labour force for years. “We’re getting out because we’re scared, but also because there won’t be any paycheques for a long time. We know there won’t be work until there’s a new government, which could be months from now,” said Haji Abasi, who took his wife and two small children on the frightening road journey from Libya. At this point, there is no violence along the three-hour drive from Tripoli to the border. Only at the border crossing is the solid green Gadhafi flag visible, a last stand for the regime, held by some of Col. Gadhafi’s most loyal security staff. But the border guards – who systematically seize cellphones from refugees, strip them of their memory cards, and sometimes harass and humiliate the escapees – are not the final threat to the exhausted people carrying their possessions in oversized bags. 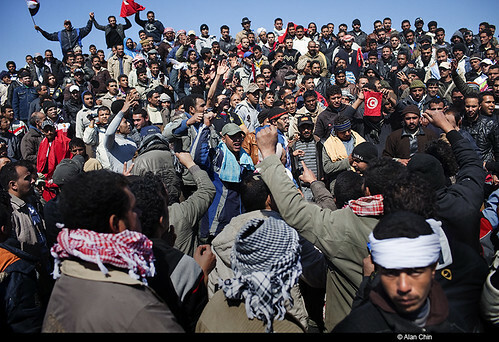 That came after the Libyan border, when on Sunday the Egyptians were blocked by aggressive crowds of Tunisian protesters who tried – usually successfully – to stop or sharply slow the flow of Egyptians, allowing only families and injured people through. The protesters include residents of the nearby border town of Ben Gardane, who feel that they are being overrun with tens of thousands of homeless Egyptians, and members of the local revolutionary committee who believe they are helping the Egyptians by drawing attention to their plight and encouraging the Cairo government to send rescue airlifts. “We don’t have any more space to accept the Egyptians – we are blocking the border until the Egyptian authorities find a solution for their transportation,” said Lutfi Tabeth, a member of the Ben Gardane revolutionary committee. It became a frightening and dangerous scene on Sunday afternoon as several thousand Egyptians charged the border, pushing through the Tunisian protesters and attempting to charge into the camps, only to be stopped by Tunisian soldiers who raised their rifles and forced them to sit on the street, closing the border again. At this point, assuming the stabilization of the Libyan situation I feel safe only in predicting the gradual return of the Egyptians and the further marginalization of sub-Saharan Africans in Libya. With these communities' association with a hated leader's brutality, however unearned and unfair, it seems safe to assume that sub-Saharan Africans will not do well at all. The Government has not done anything good for the country, let alone for Chinese Malaysians.